FORMER WBO Inter-Continental super bantamweight champion Genesis “Azukal” Servania of the Philippines scored his second straight win in Japan via a unanimous decision against Alexander Espinoza of Venezuela last September 11 at the Sangyo Hall in Kanazawa, Ishikawa. The 25-year old Servania, a former prized fighter of the ALA Boxing Stable in Cebu remained undefeated with 28 wins and 11 knockouts. Espinoza, 35, suffered his 8th loss against 11 wins with 10 KOs and one draw. Servania, a native of Bacolod City scored his first win in Japan against Indonesian Hendrik Barongsay also by a UD on December 31, 2015 at the Aichi Prefectural Gym in Nagoya, Aichi. Servania’s last fight in the Philippines was on February 7, 2015 when he successfully defended his WBO Inter-Continental super bantamweight title by a UD against Mexican Juan Luis Hernandez at the USEP Gym in Davao City. It was Servania’s third title-defense of the vacant crown he won via a 2nd round TKO against Panama’s Rafael Concepcion on October 26, 2013 at the Cebu City Waterfront Hotel & Casino. 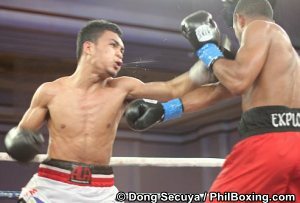 Servania retained it via a 12th round TKo against Venezuela’s Alexander Munoz last March 1, 2014 at the Solaire Resort Hotel and Casino in Paranaque City. In his second defense, Servania pummelled to submission Mexican Jose Cabrera in the 10th round at the World Trade Centre in Dubai, UAE on September 5, 2014. But after successfully retaining his crown for the third time in Davao, Servania parted ways with the ALA Boxing Promotions and went to Japan. The 5-foot-6 Servania is also a former WBO Asia Pacific super bantamweight, WBC International Silver super bantamweight and WBC International Silver super bantamweight champion. Servania won the WBO Asia Pacific super bantamweight crown by a UD win over Jorge Pazos of Mexico on August 18, 2012 at the Cebu City Waterfront Hotel & Casino. He retained it via a technical decision against Japanese Konosuke Tomiyama at the Cotai Arena of Venetian Resort in Macao last July 27, 2013. Servania also took the WBC International Silver super bantamweight title via a TKO against another Mexican Genaro Garcia on June 2, 2012 at the Resorts World Hotel in Pasay City.